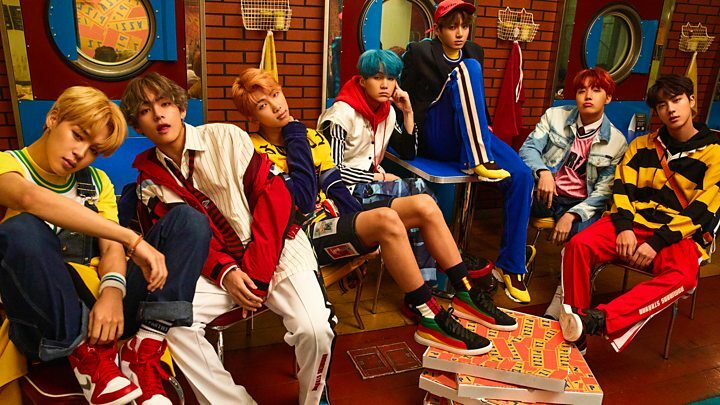 South Korean boy band BTS have become the first K-pop artists to reach number one on the US album charts. The K-pop superstars are part of the so-called Korean Wave, the global rise of Korean music, drama and film. Known for their meticulously choreographed dance style and boyish good looks, the seven-member group is one of the country’s best selling musical exports. They have developed a fiercely devoted fan base, who call themselves the ARMY. The new BTS new album, Love Yourself: Tear, topped the Billboard 200 music charts on Sunday, which are based sales, downloads and streams of albums. It had been released earlier in May. Its first single, Fake Love, premiered at the Billboard Music Awards in Las Vegas. Sung in Korean, the album is “the first primarily foreign-language No. 1 album in over 12 years,” according to Billboard. For the week ending on 24 May it came in at 135,000 album units, pushing the previous weeks’ chart topper Post Malone to number 2. BTS formed in 2013 and have won over global audiences with their blend of pop, R’n’B and hip hop. The band – made up of members Jin, Suga, J-Hope, Rap Monster, Jimin, V and Jungkook – has released albums in Korean and Japanese and have as many as 10 million followers on social media. Despite not singing in English, BTS have already toured the US and sold out venues in Los Angeles, Chicago and New York. Their upcoming world tour will take them to the US and Canada before moving on to the UK, Netherlands Germany and France. All 14 North America dates are already sold out, including the opening four consecutive concerts in the 21,000 capacity Staples Center in Los Angeles. The devoted BTS ARMY have been celebrating their album success on social media. The band has been performing since 2013. In 2017, their album Love Yourself: Her was the first K-Pop album to crack the top 10 US album charts, rising to number seven. It also hit the number one spot on iTunes in more than 70 countries. K-pop was conceived in South Korea in the 1990s as a Western-Asian hybrid and is now a multi-million dollar industry with many bands winning audiences around the globe.